Barcelona and Atletico Madrid are level on points while Real are right on their shoulder as all three take the last lap. THERE ARE FIVE games left in the La Liga season and after last weekend’s drama, everything is on the line. With Barcelona in free-fall, both Madrid clubs are perfectly placed to take full advantage. All three contenders are in action tonight and here’s how the table currently looks. Barcelona are away to Deportivo la Coruna this evening while Atletico are on their travels too, taking on Athletic Bilbao. Barca kick off at 7pm with Atleti getting underway at 7.45pm. Real Madrid’s clash with Villarreal, meanwhile, begins at 9pm. So, perhaps an early advantage for Zinedine Zidane’s side in the hunt for the title. But, Villarreal (who face Liverpool in the Europa League semi-finals) are no slouches and currently sit in the fourth and final Champions League place. Similarly, Diego Simeone’s side face a proper battle in Bilbao as Athletic Club will want to keep the pressure on Villarreal (who eliminated them from Europe last week) and keep their faint hopes of Champions League qualification alive. From Barcelona’s last five games, they’ve lost four of them. They haven’t won a league game since 12 March. They’ve been knocked out of the Champions League. Boss Luis Enrique has taken to having a pop at journalists. At the worst possible time, the wheels have started to come off. Barca have been on top since 23 January without relinquishing but if they don’t get their act together soon, they’re certain to let the championship slip from their grasp in what will go down as an epic choke. Regarding their rivals’ form, it’s Real who lead the way. They’ve won their last seven league games and that Clasico victory has spurred them on. From their last two domestic fixtures alone, they’ve racked up nine goals and are only two short of hitting 100 for the league season. But, they’re still a point behind Atleti in the standings. Simeone’s side haven’t wobbled in a while. There have been three straight La Liga victories while knocking Barca out of the Champions League was immensely motivating. With Atleti and Real still both involved in the business end of Europe’s premier competition and Barcelona not having that distraction anymore, could the extra minutes prove decisive for both Madrid clubs? Email “Explainer: It's a massive night in La Liga and here's why”. 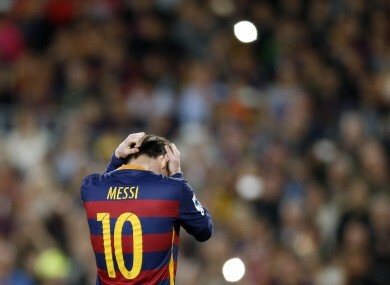 Feedback on “Explainer: It's a massive night in La Liga and here's why”.